This Information Security profile has been developed as part of the introduction in Australia of the Consumer Data Right legislation to give Australians greater control over their data. The Consumer Data Right is intended to apply sector by sector across the whole economy, beginning in the banking, energy and telecommunications sectors. These standards have been developed to facilitate the Consumer Data Right by acting as a specific baseline for implementation. These standards are governed by the Consumer Data Standards team inside Data61. Data61 has been appointed as the interim standards body. The work of the team is overseen by Mr. Andrew Stevens as interim Chair, with industry and consumer advice provided by an Advisory Committee. Data61 works closely with the Australian Competition and Consumer Commission (ACCC) as lead regulator of the Consumer Data Right, supported by the Office of the Australian Information Commissioner (OAIC). The API standards are being developed by the API Standards Working Group. Where content is present it represents decisions that have been completed. Please refer to the latest version of the API Standards for more detailed information. This is an early draft of the CDR Information Security Profile and thus subject to change. The detailed change log for this artifact is available here. This artifact details the Consumer Data Right [CDR] Information Security Profile (CDR-SP). This profile will be built upon the foundations of the Financial-grade API Read Write Profile [FAPI-RW], the Financial-grade API Client Initiated Backchannel Authentication Profile [FAPI-CIBA], and other standards relating to Open ID Connect 1.0 [OIDC]. The CDR should be consumer focussed. The CDR should encourage competition. The CDR should create opportunities. The CDR should be efficient and fair. Multiple Data Holders will be supported. Multiple Data Recipients will be supported. It is envisaged that only one registry will be supported and will be maintained by the Australian Competition and Consumer Commission (ACCC). The Data Holder (DH) is a system entity that authenticates a consumer (resource owner or user), as part of an authorisation process initiated by a Data Recipient, and issues an authorisation for that Data Recipient to access the consumer's data via published APIs. A Data Holder assumes the role of an [OIDC] OpenID Provider. A Data Recipient (DR) is system entity that is authorised by a Data Holder to access consumer resources (APIs). A Data Recipient MUST capture consumer consent prior to commencing an authorisation process with a Data Holder. A Data Recipient MUST be accredited in order to participate in the CDR Federation. Accreditation rules for Data Recipients are beyond the scope of this artifact. A Data Recipient assumes the role of an [OIDC] Relying Party (Client). The role and the functionality of the Registry is subject to change. Management of Identities and Access: The Registry will allow registered persons, on behalf of Data Holders and Data Recipients, to manage the metadata of their associated organisations and systems. Management of Certificates: The Registry will facilitate the issuing, management and revocation of digital certificates. Discoverability and Search: The Registry will expose APIs and GUIs (Web applications) in order to support metadata queries across Registry entities. A full description of the Registry is beyond the scope of this document. The Hybrid Flow outlined at section 3.3 of [OIDC]. This MUST be supported by Data Holders. The Client Initiated Backchannel Authentication flow outlined under the FAPI CIBA profile [FAPI-CIBA]. This MAY be supported by Data Holders. The [OIDC] Hybrid Flow is a type of redirection flow where the consumers user agent is redirected from a Data Recipient’s (Relying Party) web site to a Data Holder’s Authorisation endpoint in the context of an [OIDC] authentication request. 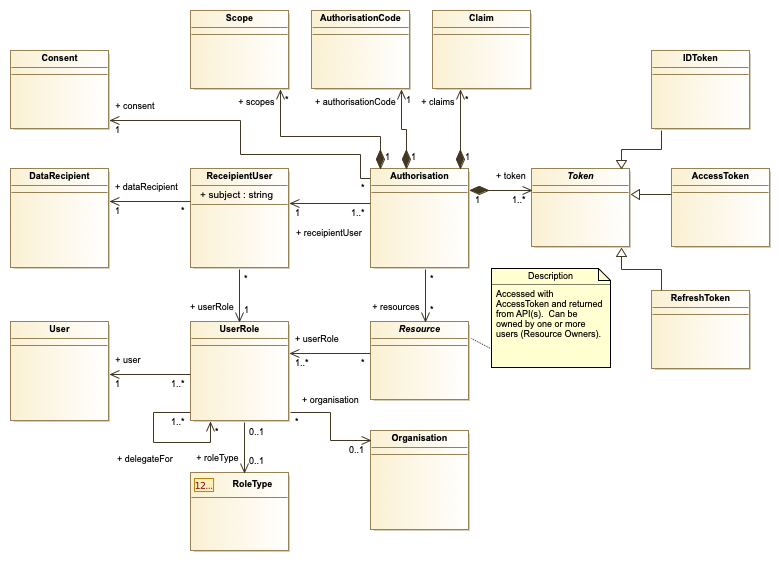 The Hybrid flow incorporates aspects of the both the implicit flow and authorisation code flow detailed under [OIDC]. Only a response_type (see section 3 of [OIDC]) of code id_token SHALL be allowed. The request_uri parameter SHALL NOT be supported. Client Initiated Backchannel Authentication (CIBA) enables a Data Recipient (Client) to initiate the authentication of an end-user at a Data Holder (OpenID Provider) by means of decoupled or out-band mechanisms [FAPI-CIBA]. Authorisation server rules for [FAPI-CIBA] are covered under section 5.2.2 of the FAPI CIBA profile. Login hints MUST not reveal Personal Information (PI) about the consumer or end-user. Client rules for [FAPI-CIBA] are outlined under section 5.2.3 of the FAPI CIBA profile. Data Holder's MUST support the private_key_jwt Client Authentication method specified at section 9 of [OIDC]. The PKI Mutual TLS OAuth Client Authentication Method SHALL not be supported. However as specified under section 11.2, all back-channel communication between Data Recipient and Data Holder systems MUST incorporate, unless stated otherwise, MTLS as part of the TLS handshake. iss: The client ID of the bearer. sub: The client ID of the bearer. aud: The URL of the endpoint being invoked. exp: A JSON number representing the number of seconds from 1970-01-01T00:00:00Z to the UTC expiry time. jti: A unique identifier generated by the client for this authentication. iat: A JSON number representing the number of seconds from 1970-01-01T00:00:00Z to the UTC issued at time. grant_type: This parameter MUST only be included when invoking the Token Endpoint and MUST be set to authorisation_code or client_credentials. code: This parameter MUST only be included when invoking the Token Endpoint after utilising the Hybrid Authentication flow. This is the value of the code parameter returned in the authorisation response. client_id: The ID of the calling Client. client_assertion_type: This MUST be set to urn:ietf:params:oauth:client-assertion-type:jwt-bearer. client_assertion: The encoded assertion JWT. Only Confidential Clients SHALL be supported under this profile. Therefore, Public clients SHALL NOT be supported. ID Tokens are specified in section 2 of the [OIDC] standard. In accordance with [FAPI-RW], ID Tokens must be signed and encrypted when returned to a Data Recipient from both the Authorisation Endpoint and Token Endpoint. nonce: String value used to associate a Client session with an ID Token. s_hash: Hash of the state value. c_hash: Hash of the authorisation_code value. ID Tokens MUST be signed by Data Holders as specified in section 8.6 of [FAPI-RW]. The ID Token returned from the Authorisation Endpoint MUST NOT contain any Personal Information (PI) claims. An ID Token MUST not contain both a vot claim (see Vectors of Trust) and an acr claim . vtm: The trustmark URI as specified in section 5 of [VOT] . The c_hash value MUST be generated according to section 3.3.2.11 of [OIDC]. The s_hash value MUST be generated according to section 5.1 of [FAPI-RW]. Access Tokens MUST be used as specified in section 10.3 of [OAUTH2]. An Access Token MUST expire n minutes after it is issued by the Data Holder where n is determined by [CDR] rules. The process for refreshing an Access Token is described in section 12.1 of [OIDC]. Refresh Tokens MUST be supported by Data Holders. The usage of Refresh Tokens is specified in section 12 of [OIDC]. A Refresh Token MUST expire n days after it is issued where n is determined by [CDR] rules. Industry-specific scopes (for example, bank_account) will not be referenced in this profile. openid: As described as section 3.1.2.1 of [OIDC], this scope MUST be present on each authentication request. profile: Data Holders MUST support the profile scope as described in section 5.4 of [OIDC]. This scope MAY be present on an authentication request. sub: Pairwise Pseudonymous Identifier (PPID) for the End-User at the Data Holder. acr: Authentication Context Class Reference. MUST contain a valid ordinal LoA value. auth_time: Time when the End-User authentication occurred. Its value is a JSON number representing the number of seconds from 1970-01-01T00:00:00Z to the UTC auth_time. name: End-User's full name in displayable form including all name parts. given_name: Given name(s) or first name(s) of the End-User. family_name: Surname(s) or last name(s) of the End-User. updated_at: Time the End-User's information was last updated. Its value is a JSON number representing the number of seconds from 1970-01-01T00:00:00Z to the UTC updated_at time. vot: MUST contain a valid VoT value. vtm: The [VOT] trustmark URI. The identifier for an authenticated end-user (subject) MUST be passed in the sub claim of an ID Token and UserInfo response as defined by [OIDC]. The Data Holder MUST generate the sub value as a Pairwise Pseudonymous Identifier (PPID) as described in section 8 of [OIDC]. Furthermore, the identifier SHOULD also be unique relative to the scenario in which the end-user has authenticated. For example, the identifier generated for the same person when they are using a business account SHOULD be different to the identifier that is generated when that same individual is authorising as an individual. It is RECOMMENDED that the sub value is generated as a universally unique Identifier (UUID) [RFC4122]. Single Ordinal: A single LoA value is represented. Data Holder's MUST support this mechanism. Vector: One or more LoAs, represented by a vector value, are represented. Data Holder's MAY support this mechanism. A Single LoA value is carried in the acr claim which is described in section 2 of [OIDC]. The authenticator used to attain this level MUST conform with the Credential Level CL1 rules specified under the Trusted Digital Identity Framework [TDIF] Authentication Credential Requirements specification. The authenticators used to attain this level MUST conform with the Credential Level CL2 rules specified under the Trusted Digital Identity Framework [TDIF] Authentication Credential Requirements specification. READ operations SHALL only be allowed where at least an LoA of 2 has been achieved. WRITE operations SHALL only be allowed where at least an LoA of 3 has been achieved. It is anticipated that due to their characteristics, which include composability, extensibility, and expressiveness, VoTs will be become the relevant standard for assurance representation at Identity Providers. Furthermore, as the [CDR] matures and incorporates requirements for Identity Proofing, Credential Management, and Assertion Presentation, these independent LoAs will be progressively added to the VoT [CDR] ecosystem. However, the dynamic capabilities of [VOT] will ensure that their addition does not break existing [CDR] implementations. CL1: This is Credential Level CL1 defined by the [TDIF] Authentication Credential Requirements specification. CL2: This is Credential Level CL2 defined by the [TDIF] Authentication Credential Requirements specification. READ operations SHALL only be allowed where at least a CL1 has been provided. WRITE operations SHALL only be allowed where at least a CL2 has been provided. The Trustmark URI is yet to be defined. Additional content will be added to this section when the Registry requirements are established. For example, verification/revocation of transport certificates. The presented Client transport certificate MUST be issued by the CDR Certificate Authority (CA). The Server MUST NOT trust Client transport certificates issued by other authorities. The presented Server transport certificate MUST be issued by the CDR Certificate Authority (CA). The Client MUST NOT trust Server transport certificates issued by other authorities. MTLS MUST be supported as a Holder of Key (HoK) Mechanism. MTLS HoK allows issued tokens to be bound to a client certificate as specified in section 3 of [MTLS]. The Request Object is a signed and encoded JWT specified in section 6.1 of [OIDC]. As per [FAPI-RW] section 5.2.2 and [FAPI-CIBA] section 5.2.2, the request parameter MUST be present on requests to both the [OIDC] Hybrid Authorisation Endpoint and [FAPI-CIBA] Backchannel Authorisation Endpoint. 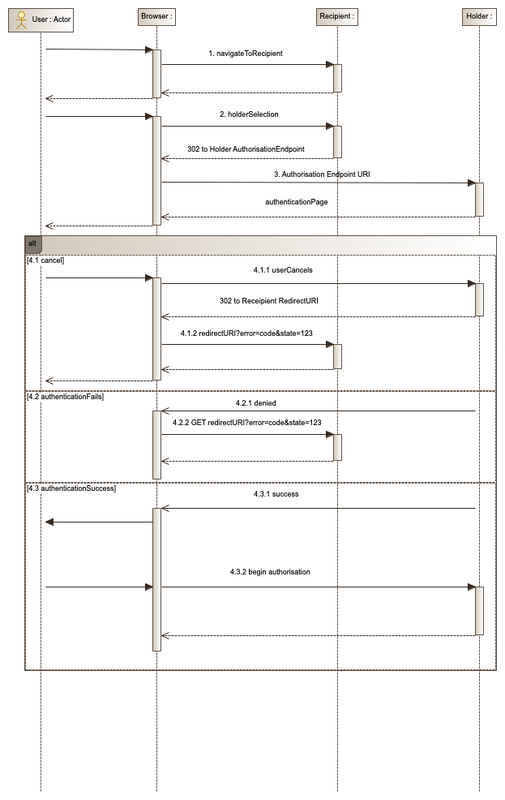 The Request Object enables [OIDC] requests to be passed in a single and self-contained parameter. Request Objects MUST be signed by Data Recipients as specified in section 8.6 of [FAPI-RW]. Data Recipients MUST include a cdr_consent_id value in the Request Object. A high-level overview of consent is provided in the section 14 of this artifact. Data Holder Authorisation Servers MUST treat a Request Object that does not contain a cdr_consent_id as an essential claim as invalid. Request Object references SHALL NOT be supported. The iss claim SHALL NOT be supported as it duplicates the role of the client_id claim. Allowed Values are specified in the VoT values section of this artifact. This value MUST contain a space-separated string that specifies the vot values that the Authorization Server is being requested to use for processing this Authentication Request, with the values appearing in order of preference. The VoT satisfied by the authentication performed is returned as the vot Claim Value. The vot Claim is requested as a Voluntary Claim by this parameter. This is the VoT equivalent of an acr essential claim. If the vot Claim is requested as an Essential Claim for the ID Token with a values parameter requesting specific VoT values, the Data Holder Authorization Server MUST return a vot Claim Value that matches one of the requested values. The Data Holder Authorization Server MAY ask the End-User to re-authenticate with additional factors to meet this requirement. If this requirement cannot be met, then the Data Holder Authorization Server MUST treat that outcome as a failed authentication. SHALL, where a Data Holder supports [VOT], request user authentication with a Credential Level of 2 (CL2) or greater by requesting the vot claim as an essential claim. OpenID Provider Configuration is directly impacted by the emerging requirements of the Registry and thus subject to change. Data Holders MUST make their OpenID Provider Metadata available via a configuration endpoint as outlined in Section 3 and 4 of the OpenID Connect Discovery standards [OIDD]. Where a Data Holder is supporting Vectors of Trust [VOT] or FAPI-CIBA [FAPI-CIBA], the published OpenID Provider metadata SHALL reflect that support. issuer: URL that the Data Holder asserts as its Issuer Identifier. authorization_endpoint: URL of the Authorization Endpoint. token_endpoint: URL of the Token Endpoint. introspection_endpoint: URL of the Introspection Endpoint. revocation_endpoint: URL of the Revocation Endpoint. userinfo_endpoint: URL of the UserInfo Endpoint. jwks_uri: URL of the JWKS Endpoint. scopes_supported: This list of supported scopes. claims_supported: The list of supported claims. acr_values_supported: The supported ACR values. vot_values_supported: The list of supported component values. backchannel_authentication_endpoint: The CIBA Authorisation Endpoint. backchannel_authentication_request_signing_alg_values_supported: JSON array containing a list of the JWS signing algorithms (alg values) supported by the OP for signed authentication requests. Only ES256 and PS256 SHALL be supported. The requirements for the Authorisation Endpoint are specified in section 3.3.2 of [OIDC] and further specified under section 5.2.2 of [FAPI-RW]. This endpoint is invoked as part of the Hybrid Authentication flow. A description of requirements relating to the request parameter can be found in the section 12. The requirements for the Backchannel Authorisation Endpoint are specified in the Client Initiated Backchannel Authentication Profile [FAPI-CIBA]. This endpoint is invoked as part of the Client-Initiated Backchannel Authentication flow. Data Holder's that feature [FAPI-CIBA] MUST support the poll mode and MAY support the ping mode. The push mode SHALL not be supported. The requirements for the Token Endpoint are specified in section 5.3 of [OIDC]. To obtain an Access Token, an ID Token, and a Refresh Token, the Data Recipient sends a Token Request to the Token Endpoint. Data Holders MUST support a Token Endpoint. The requirements for the UserInfo Endpoint are specified in section 3.3.3 of [OIDC]. Data Holders MUST support a UserInfo Endpoint. The implementation of the JWKS Endpoint is directly impacted by the emerging requirements of the Registry and thus subject to change. Private keys MUST NOT be published at this endpoint. kid: This is used to match a specific key within a JWKS and thus must be unique within the set. use: This is used to identify the intended use of the public key. Supported values are sig and enc. Data Holders MUST implement an Introspection Endpoint to allow Data Recipients to determine the status and expiry date of Refresh Tokens. The requirements for an Introspection Endpoint are described in section 2 of [RFC7662]. Introspection of Refresh Tokens MUST be supported. Introspection of Access Tokens and ID Tokens MUST NOT be supported. active: Boolean indicator of whether or not the presented token is currently active. Data Holders MUST implement a Token Revocation Endpoint as described in section 2 of [RFC7009]. The Revocation Endpoint serves as a revocation mechanism that allows a Data Recipient to invalidate its tokens as required. Notifying the Data Holder authorisation server that the token is no longer needed allows the server to clean up data associated with that token and the underlying authorization grant. Revocation of Refresh Tokens and Access Tokens MUST be supported. Dynamic Client Registration functionality is directly impacted by the emerging requirements of the Registry and thus subject to change. To register as a new Client at a Data Holder's Authorisation Server, a Data Recipient MUST POST its Client metadata to the Data Holder's Registration Endpoint in the form of an (encoded) signed JWT [JWT]. This process is specified in OpenID Connect Registration [OIDC-CR]. The registering [JWT] is signed by the private key of the Client and MUST include a software statement. The software statement is an encoded JWT [JWT] signed by the CDR Certificate Authority private key and thus supports non-repudiation. The content of and mechanism for retrieving and generating a software statement is beyond the scope of this profile. iss: The Data Recipient identifier specified at the Registry. aud: The Data Holder identifier specified at the Registry. jti: A unique identifier generated by the Data Recipient. redirect_uris: An Array of Redirection URI values. software_statement: This is an encoded JWT which includes several claims that describe the Data Recipient application and the Data Recipient organisation. 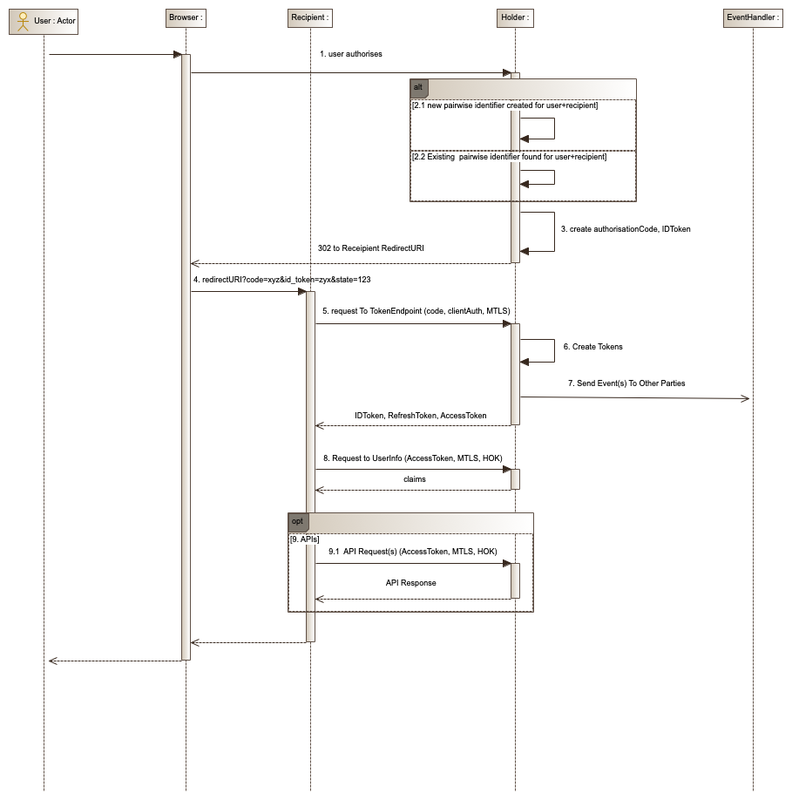 id_token_signed_response_alg: Token Endpoint preferred signing algorithm. 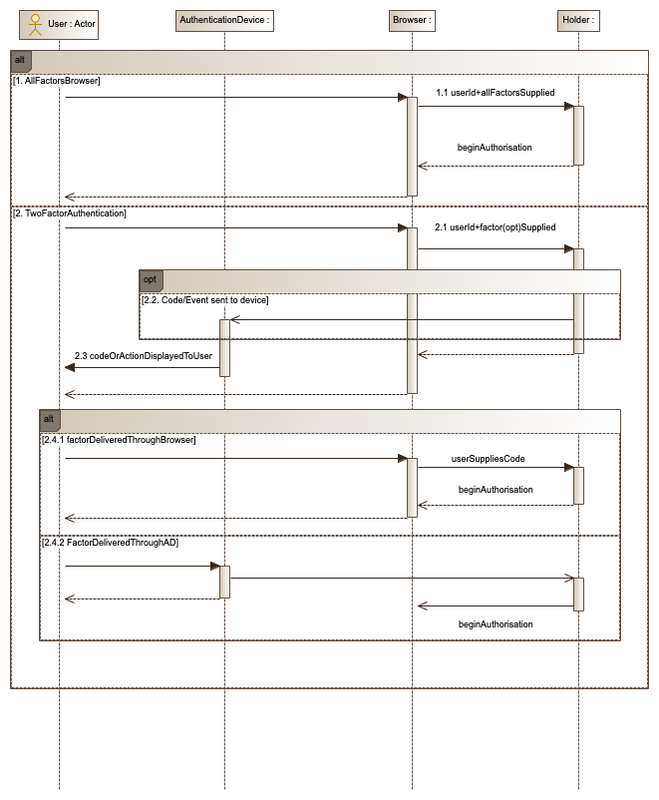 request_object_signing_alg: Request Object signing algorithm. 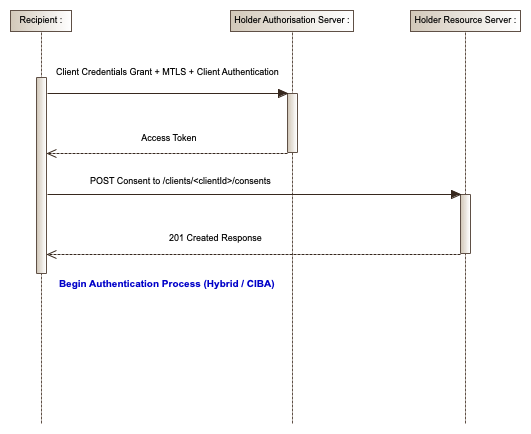 token_endpoint_auth_method: The chosen Client authentication mechanism. backchannel_token_delivery_mode: This MUST be set to a value of ping or poll. push mode SHALL NOT be supported. backchannel_authentication_request_signing_alg: MUST be set to ES256 or PS256. backchannel_client_notification_endpoint: This is the endpoint to which the OP will post a notification after a successful or failed end-user authentication. This request MUST be made with MTLS as specified in section 11.2. Data Holders MUST ensure that the CN (Common Name) in the Client certificate subject field matches the software_id claim present in the software statement. Data Holders MUST verify that the embedded software statement has been signed by the CDR Certificate Authority. The Data Holder MUST respond in accordance with OpenID Connect Registration [OIDC-CR] sections 3.2 and 3.3. How querying, communication, and revocation of consent will be supported technically are a current key area of focus. An approach to consent will be published in January 2019, for the purposes of delivering version 1 of the standards. Prior to initiating an authentication request to a Data Holder's Authorisation Server, a Data Recipient MUST have captured indicative Consumer Consent and passed this to the Data Holder. A Consent occurrence is assigned a unique cdr_consent_id and is referenced by the Data Holder as part of an authorisation process with a Consumer. This process binds the Consent to the authorisation. In order to support this functionality, a Data Holder MUST implement and host an API to support the creation of a Consent, the querying of a Consent, and the deletion of a Consent. In this instance the Data Recipient is to be considered the Resource Owner of the Consent occurrence. The specifics of the Consent API and processing of Consent are beyond the scope of this document. Support the grant type of client_credentials strictly for the purpose of passing an Access Token to a Data Recipient which can be then used to invoke the Consent API. The end-user navigates to a Data Recipient Website. The end-user selects their preferred Data Holder. The end-user's browser is redirected to the Data Holder's Authorisation Endpoint. The end-user may cancel the process at any point (in Parts A, B or C) and will be returned to the passed redirection URI for the Data Recipient with the relevant error code. The end-user is denied access. This may happen as a result of too many failed attempts or other conditions relating to the end-user's account. The end-user's browser will be redirected to the passed redirection URI for the Data Recipient with the relevant error code. The end-user successfully authenticates and begins the authorisation step (see Part B). Part B illustrates the different authentication methods a Data Holder may present to the end-user. It is important from a usability perspective that the Data Holder authentication choices presented to the end-user are consistent with those currently utilised by the end-user when accessing their existing Data Holder online accounts. All Credentials/Factors are captured through the Browser. On success, the authorisation process begins (Part C) . A userId and optionally a password are entered to the browser and submitted by the end-user. A code or notification is sent to a end-user's pre-registered mobile/device application (detached authentication device). This step is optional as an end-user's device application may generate codes in isolation, as is the case for Time-based One-Time Password (TOTP). The end-user views the code or event on their detached authentication device. The end-user directly enters the code (or scans a QR Code) into the browser and submits the request. On success, the authorisation process begins (Part C). The end-user does not enter the code into the browser. The end-user acknowledges the authentication through the device and a secure message is sent from the device to the Data Holder via a backchannel. On receipt of the message, the Data Holder's website redirects the end-user's browser to the authorisation page (Part C). This process continues from Part B after a successful authentication. The end-user authorises the transaction. The Data Holder creates a new pairwise identifier for the end-user and Data Recipient combination. This is the first time the end-user has authenticated to the Data Holder in the context of a request from this Data Recipient. This is a reauthentication. The end-user has previously authenticated to the Data Holder in the context of an authentication request from this Data Recipient. The existing pairwise identifier for the end-user and Data Recipient is allocated to the authorisation. The Data Holder creates the authorisation code and ID Token for the authorisation instance. The end-user's browser is redirected to the Data Recipient's redirect URI. The ID Token and authorisation code generated in Step 3 are attached to the URL as a fragment. The Data Recipient web server processes the request. The Data Recipient decrypts the ID Token, verifies the signature and issuer of the ID Token, verifies the state/code hashes within the token, and also matches the presented state against its own session state. The Data Recipient then sends a POST request to the Data Holder Token Endpoint using Client Authentication and the Authorisation Code. The Data Holder Endpoint authenticates the Data Recipient client and matches the authorisation code. On success, the Endpoint responds with an Access Token, Refresh Token and an ID Token. The Data Holder creates an event relating to the authorisation. This event is propagated/handled and may result in shared resource owners being notified about the authorisation. The Data Recipient verifies the ID Token and on success, invokes the UserInfo Endpoint using the Access Token as a Bearer Token. The Data Holder verifies the token, applies the necessary Holder of Key verification check and on success, returns the requested UserInfo claims. The Data Recipient optionally begins calling the Data Holder APIs with the Access Token and renders the result to the end-user's browser. This diagram depicts the domain model of a hypothetical Data Holder. It is in no way prescriptive but illustrates the associations between the authorisation-related entities that may exist within a Data Holder's domain.